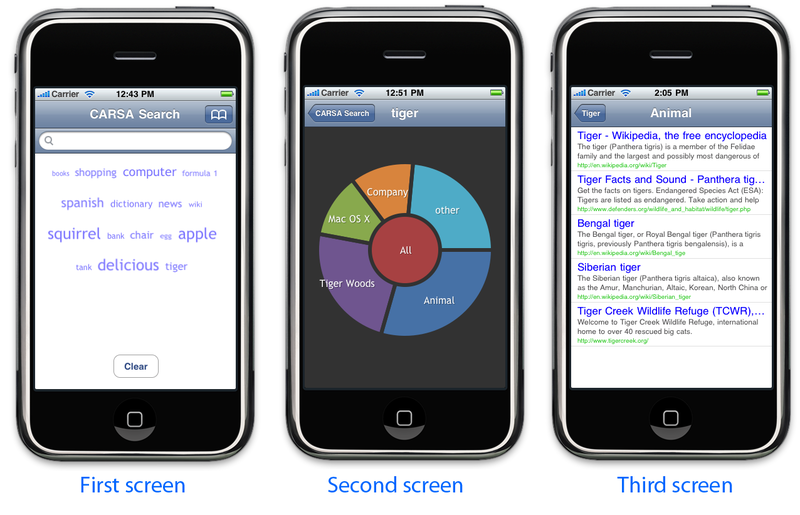 CARSA Search was the iPhone application that I developed for my Bachelors Thesis. The Abstract can be found below. As mobile devices are becoming more advanced and the number of devices connected to the internet is rising, information search and organization has become an important aspect on these devices. Unlike personal computers, mobile devices have small displays and offer other methods of interaction. This is why information search and organization has to be tailored to the specific features of these devices. The purpose of this thesis is to develop an ergonomic user interface which supports information search specifically tailored to interaction methods, like multi-touch, which are used by a number of mobile devices known as smartphones. The interface will be connected to the Context Adaptive Retrieval System Architecture (CARSA), which will process the user’s queries and return results to her or him. 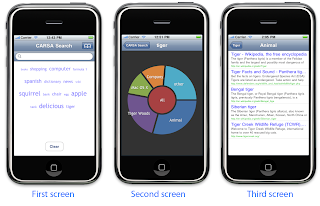 CARSA offers special features like clustering, which are not available in the standard search on most smartphones. The aim is that these features coupled with a good design will offer a new search experience that users prefer over the old one.